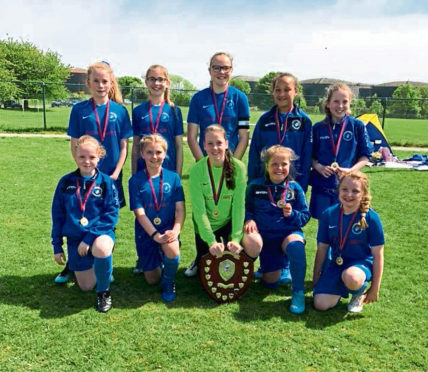 A Highland schools football tournament for girls, held for the first time at Invergordon on Tuesday, has been hailed as a success – with Park primary school running out winners. The event, attended by more than 200 pupils from 20 schools, was created on the back of the success of the Ross-shire girls’ football tournament which was held for the first time last year. Teams were split into four groups of five prior to a knockout phase, with Park taking the main prize at the Recreational fields. Their 1-0 win against last year’s winners of the Ross-shire tournament, Craighill, secured the PSG Marine and Logistic Shield for teams that finished first and second in their groups. Dingwall won the Port of Cromarty Firth Shield, a separate knockout phase for teams finishing third and fourth in their groups, with a penalty shootout victory over Avoch. Bun-sgoil Ghaidhlig Phort Righ won the sportsmanship final with a 1-0 win over Lochcarron.